This postcard, which is from the 1980s, shows Downtown Concord (before the Brenden Theatre) and before many other noticeable buildings. If you click on the postcard, you’ll get a MUCH larger view. In the middle of the postcard, try to spot the blue roof, that’s the old International House of Pancakes, which used to be where the Brenden Theatre currently sits. The late 1900’s. Like 1908 or 1909? Because it looks more like the late 20th Century to me. If you have plans at 6:45 and you are running late, do you ever suggest quarter to seven instead? That’s too easy I’m the morning for me. Are you suggesting having dinner at a quarter to seven INSTEAD of 6:45? Because that’s the same thing, not one thing instead of something else. As is the case with the 1920’s the 1930’s, 1990’s, etc., the 1900’s refers to a decade, not an a entire century. Accuracy is a harsh mistress. No, not really: if you were to say “in the 1800’s”, that can mean anytime in the, same with in the ‘1900s’. I think the late 1900s would be the 1980s or the 1990s. I don’t view it as the decade I view it as the century. Who cares anyway, you know what claycord meant. It is obvious it isn’t 1908 so quit being an idiot. We new what he meant by late 1900s so ge over it! this post card must be old… the Masonic Temple is still located on Concord Ave. I remember the old IHOP!!! Looked like a ski chalet from Switzerland. And I see Bud’s Saw Shop (later Bay Area Carbide) owned by my friend’s dad, the gas station owned by my childhood neighbor, and the nice lawn that caused my dentist to relocate, and I zoomed in really close and spotted an early homeless camp by the overpass. I would say around 1985-1989? Or whenever the old Concord ice and fuel was torn down to make room for a car dealership. Does anyone know when that was? I worked at IHOP in the latter part of the 20th century……..I can see the big blue roof right across from the dealership which is mostly covered by that big building. I wonder if they’ll ever build the 2nd tower on the corner of Grant and Clayton. Tower II will not be built, but unfortunately there are current plans to build an apartment complex on that site and on the property across the street where the apartment building will take up the entire square block except for the part of the property where the parking garage is located. As long as they don’t post any of my old Concord High photos from the 70’s….I’ve put on a few. I can see no Auto Row. Concord Pavilion is somehow sold out. Looks like Walgreens may not have been there???? BART parking lot is SUPER under utilized… maybe this was a weekend. Baker’s Square was on Willow Pass…. and they had good Berry Pies. ABBA Storage does not appear to be alongside freeway as well. Frys is not built up either, nor is the building it sits in, from what I can see. Wait, looking again, there is an Igloo Playmate at the Concord Pavilion…. that definitely will never be seen there again on the lawn! There appears to be an IHOP where Agave Grill and Brendan are today. I have ’68 to ’72 CHS yearbooks, you’re probably in one of them. Are we suppose to look the same? How come none of those poles got hit like the fire hydrants lately?…..or was one ever hit? What big street is that through the upper half? I think you might be looking at SR-242, if you’re talking about the roadway from the left to the right on the upper section of the postcard. Thank you THE BLACK KNIGHT, and the big one crossing it? That roadway is Concord Avenue. At the very top of the postcard it’s going over the creek and there are some hangers at Buchanan Field to the right of the roadway. 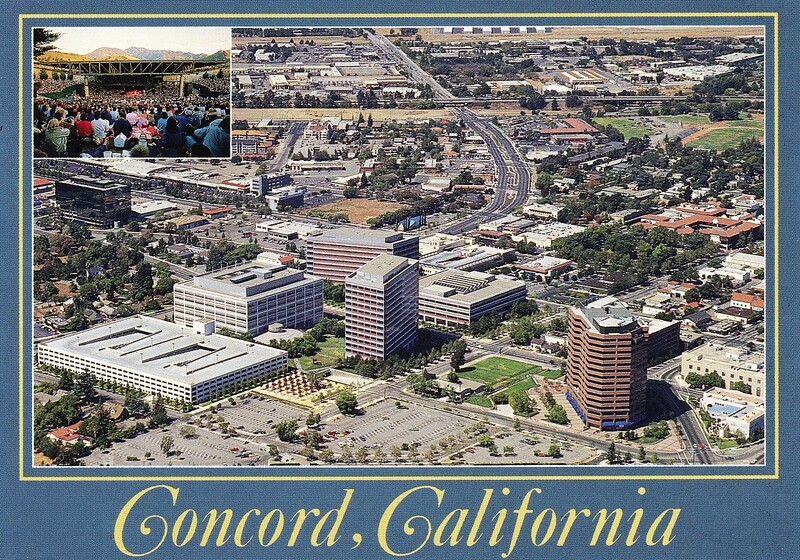 Who would ever buy a postcard of Concord? Who would ever get excited by receiving a postcard of Concord? You’ve never lived in Mudpuddle Mississippi have you? The pine trees around the BofA tech center’s parking garage were recently planted when this photo was taken so after 1986. Those same trees are taller than the garage structure now. An IHOP surrounded by trees and plenty of free, convenient parking…can it be brought back?